Athena’s Melvin Council, Jr. looks to drive baseline. Mendon’s Connor Krapf defends on the play. 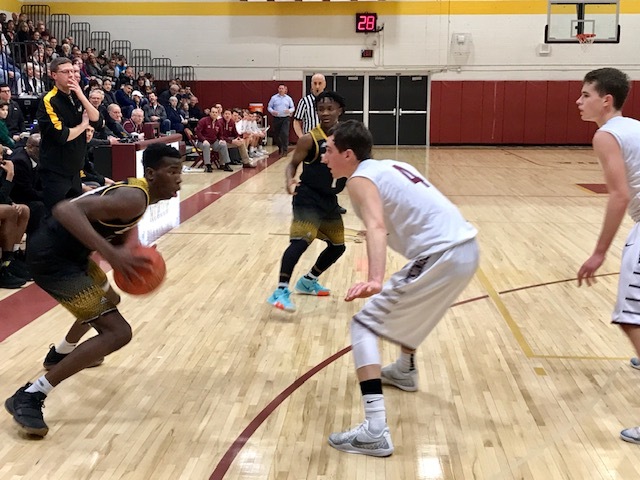 MENDON, N.Y. — When they met earlier this season, Greece Athena and Pittsford Mendon exchanged leads nine times in the fourth quarter alone. Neither team led by more than six points in the contest. Friday’s matchup bore little resemblance to that previous meeting. Mendon won the opening tip, and Michael Harrington drilled his first of five 3-pointers. The Vikings scored the first six points. Jacob Shadders connected on a 3-ball of his own to start the second quarter. Mendon led 21-9. Athena did not cut the margin to single digits for the remainder of the night. Cook finished with 14 points and 12 rebounds for his 17th double-double of the season. He was one of four Vikings in double figures. Harrington led the way with 27. Shadders added 16, and Connor Krapf had 15. The 83 points marked the most Athena’s defense has allowed this season. With the win, Mendon (18-0/No. 3 NYSSWA Class A) capped an eight-day stretch which saw the Vikings take four games including victories at Fairport (with a record of 13-5) and over Leadership Academy (11-7). Friday night’s win, though, carried with it added emphasis. Athena (15-3/No. 11 NYSSWA Class A) came into the game riding an eight-game winning streak, four of those triumphs by double digits. They also traveled to Irondequoit where the Trojans knocked off the two-time reigning Class A1 champion Eagles, 64-61. Two days later, they outlasted divisional rival Pittsford Sutherland. After that, Athena avenged an earlier loss when they held Hilton (averaging a shade under 70 points per game) to its lowest output of the season in a 59-49 win. If any team could end Mendon’s undefeated run, the Trojans fit the bill. The Vikings had none of it. Starting late in the first quarter, Mendon put together a stretch where they scored on seven of nine possessions. In what seemed like the blink of an eye, the Vikings turned a one-point game into a 25-13 advantage. All five starters tallied during the run. Harrington drilled a 3-ball from the left wing. Krapf followed an and-one with a steal and layup. Shadders closed the opening stanza with a floater before splashing a three to open the second. Cook scored in transition, and Shadders threaded a diagonal feed to Nate Strauf on the break for an easy lay-in. The last two buckets represented Mendon at its best: running the floor and finding the open man. Nally pointed to his sophomore guard for his squad’s success in the open floor. Friday night’s performance was nothing out of the ordinary for Mendon. Cook came into the game averaging 19.7 points per game. Harrington scores 18.9. Add Shadders (13.9) and Krapf (11.3) and the Vikings represent a true pick-your-poison type of offense. Shadders finished with seven assists. Krapf had six. Strauf, the fifth Beatle, scored two points. Charlie Bennett came off the bench and added two points. Kyle Hennesy (4) and William Orzell (3) rounded out the scoring for Nally’s squad. DeAndre Newsome paced Athena with 18 points. Melvin Council, Jr. added 17. Isaiah Brock and Johnny Salone scored six apiece. Kelvin Reaves, Jr. chipped in with five points. Terrell Wilson, Jr. (3) and Austin Brown (2) also scored for Athena.